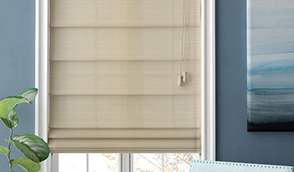 The placement of your Roman Shade depends on several elements. If your home has gorgeous moldings, you may opt to mount your shade on the inside of the window frame and still be able to keep the architectural details on view. Or, if your home is fairly modern and the moldings are rather simple, mount the shades on the outside of the window. This option also provides light blockage and privacy as the shade is slightly wider than the window. You may even choose to mount the top of the shade several inches above the top of the window frame to add more height to your room. Today's Roman Shades are more advanced than the original window covering. 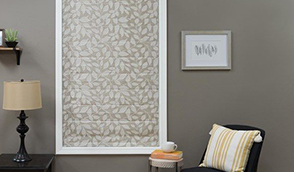 The sheer variety of fabrics and transparency means this versatile shade offers something for everyone. 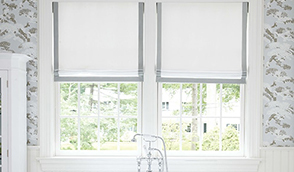 With innovations in liners and operating systems, the clean, modern Roman Shade has never looked better. Contact DC Shutters for High Quality Roman Shades in Brampton, Toronto, Oshawa, Oakville, Kitchener, Waterloo, Hamilton, Niagara, Toronto, Richmond Hill, Aurora, Newmarket, Ajax, Whitby, ON.